We answer promptly, cheerfully, and we sound just like we’re working in your office. If you’re looking for someone that will not only take messages but also represent your company well on the phone, call us at 855-247-6767. First impressions are lasting impressions. When a potential client calls your office for the first time, you only have one chance to make a great first impression. We’re a small business, and so we know how incredibly important every potential new customer is. We’ll answer with a friendly voice and get the information back to you fast. We offer a two-week free trial, and we will work hard for your business. Sample message on a smartphone. Get your messages by E-mail, Text, or Fax. All of our automated message dispatch options are free. You can choose to use any of the above options, or a combination. 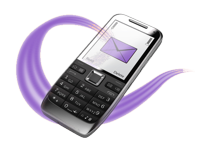 Calls can be dispatched differently according to who the caller asks for or type of call. For instance, non-urgent messages could be simply e-mailed to the office — while urgent calls could be sent by text and e-mailed. You can still opt to have us call you verbally as well. We can do 90% of the job at 10% of the cost. If you don’t have a receptionist or need someone to augment the great people you already have, we can help. We can be that friendly voice that answers your business line, consistently, and in your company name. We can put calls directly through to someone, schedule appointments, relay an urgent call, or simply e-mail and text a message directly to someone. Just let us know, we’ll work with you to find a solution that meets your needs. You can choose to have us answer only when you are gone, or automatically in case you don’t answer after so many rings or all of your lines are busy. And, best of all, there’s no long-term contract, we’ll never call in sick, or complain about what you microwaved for lunch. Every potential new customer is precious. Most small businesses spend a lot of time and effort encouraging potential customers to call them. What happens when they call you? If they get voicemail, a phone that rings seven or eight times, or they get left on hold for five minutes, some portion of them will hang up and call someone else. A bad answering service — one that answers with unfriendly people, or puts most calls on hold — is even worse than voicemail. They may quote you a low rate, but that doesn’t help much if they end up losing you potential business. A good small business answering service will answer with a friendly voice, make a great first impression on that potential client, and delight your existing clients with excellent customer service. We answer over 80% of calls by the third ring and we think you’ll be very pleasantly surprised by our operators. Call us for a quote! Two-week free trial. No contract. No setup fee.